Very early in his presidency, Donald Trump signed an executive order suspending entry to the United States for citizens from seven Muslim-majority countries—Iran, Iraq, Libya, Somalia, Sudan, Syria, and Yemen. His suspension did not, however, include larger Muslim-majority countries where the Trump Organization has conducted or pursued business, such as Egypt, Turkey, and Saudi Arabia. The omissions further raised eyebrows because Egyptian citizens have been directly linked to terrorist attacks on U.S. soil, while citizens from some of the banned countries have not. In September 2007, Trump incorporated two companies in Egypt: Trump Marks Egypt Corp. and Trump Marks Egypt LLC. According to Trump’s July 2015 financial disclosure—which was not verified by regulators and therefore may not include all of his foreign deals or assets—Trump owned, had ownership interest in, or was a managing member of these two seemingly inactive companies. 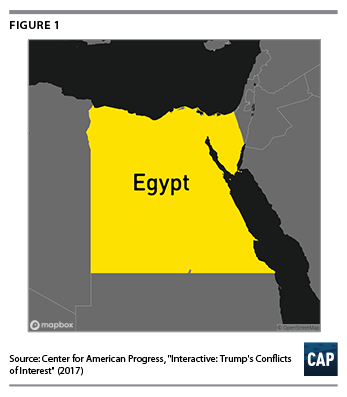 He served as president, director, and chairman of Trump Marks Egypt Corp. and was listed as the president and a member of Trump Marks Egypt LLC. But because of Trump’s continued insistence on hiding his tax returns and general evasiveness when it comes to his business dealings, it is unclear the purposes for which these companies were created and their future plans. 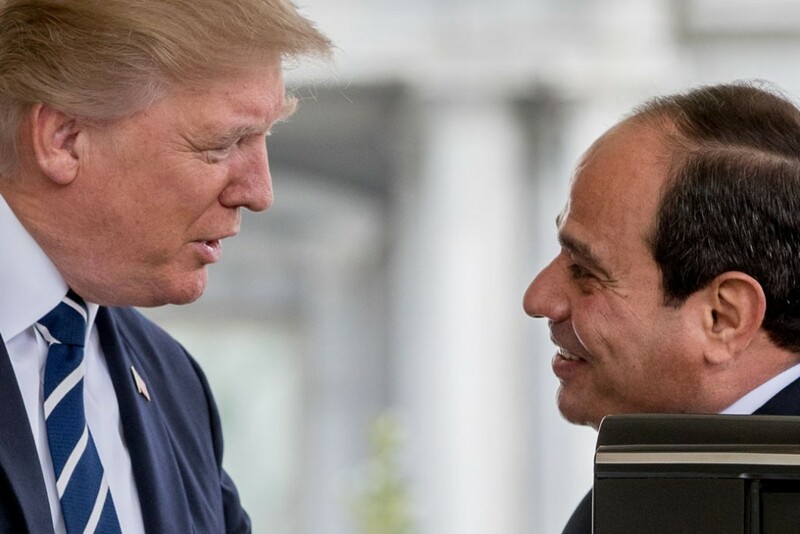 Egyptian President Abdel Fattah al-Sisi has been eager to sing Trump’s praises, in part because Trump has been relatively unconcerned about Egypt’s troubling human rights record under his stewardship. Trump praised Sisi’s role in the 2013 coup that removed former President Mohamed Morsi from power, saying, “He took control of Egypt. And he really took control of it.” Obviously pleased, Sisi said that Trump has shown a “deep and great understanding” of the region, and Sisi avoided criticizing the travel ban since Egypt was not included on the list. Sisi also enjoyed a warm White House welcome in April. Yet Egypt’s repression may be making extremism worse—not better—and the U.N. High Commissioner for Human Rights warned recently that Egypt’s use of brutal security measures risks cultivating the very radicalization it seeks to curb. President Donald Trump has shown a troubling empathy for strongmen around the world. But do his business interests provide an additional reason to soft-pedal his response to Egyptian repression? Was Trump thinking about his family’s bottom line instead of America’s interests? So long as Trump is unwilling to truly divest his international holdings, he cannot disprove or dispel the suspicion that his foreign policy might be for sale to—or held hostage by—high-bidding autocrats in countries where he has business interests. Read the full series of columns here, and see the interactive map here. Carolyn Kenney is a policy analyst with the National Security and International Policy team at the Center for American Progress. John Norris is a senior fellow at the Center.